CHICAGO (WLS) -- Chicago residents having trouble paying their heating bills this winter can get help. 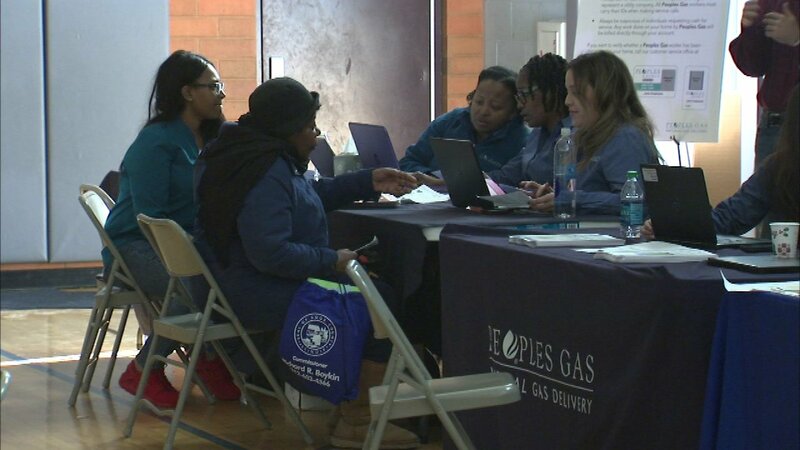 On Saturday, Peoples Gas, the Community Economic Development Association (CEDA) and U.S. Rep. Danny K. Davis, D-Chicago, hosted the Winter Resource Fair at Skinner Classical School on the West Side. Eligible residents worked with CEDA to apply for Low Income Home Energy Assistance Program (LIHEAP) and the Peoples Gas Share the Warmth program. LIHEAP is a federally funded program that provides grants to help customers pay toward their energy bills, reconnect natural gas service and maintain their home's gas service. Share the Warmth is an energy assistance program funded through donations from Peoples Gas and North Shore Gas, their employees and customers. It provides matching grants of up to $200 to qualifying customers. Peoples Gas customers who did not attend Saturday's fair can still get assistance. For more information, visit peoplesgasdelivery.com or cedaorg.net or call CEDA's hotline at 800-571-CEDA (2332) to find the location of the closest LIHEAP application site and more information.